While the main stream media has been proven to be the campaign mouthpiece for the DNC…oh, wait. Forgive me. Have you forgotten about the #DNCLeaks from Julian Assange? The leaks that exposed the press for colluding with the DNC and the DNC rigging the primary election to secure the nomination for Hillary? Bernie Sanders’ supporters should feel at least partially vindicated, as their suspicion of the DNC working closely with establishment media has been confirmed in at least one thread. In one particularly damning exchange, Mark Paustenbach is seen referring to an “agreement” with Politico’s Ken Vogel to let the DNC pre-screen one of his stories before they’re sent to Vogel’s editors. Knowing this cozy arrangement, we should not expect a lack of bias in journalism. 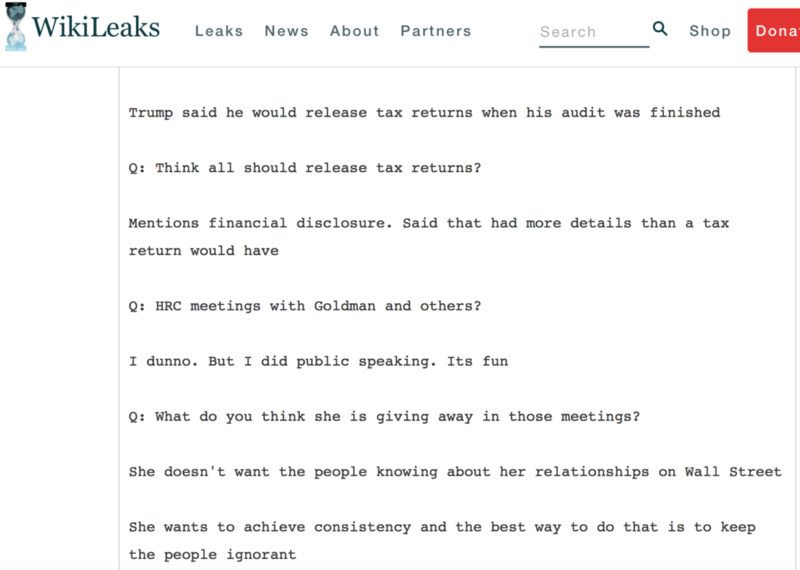 Honesty, ethics, and the truth be damned in order to save Hillary Clinton. Perhaps those in the media will finally come out of the progressive closet by tweeting #ImWithHer. Many thanks to Julian Assange for letting that rotting cat out of the bag. The Clinton News Network didn’t earn its’ moniker from suspicious conservatives for nothing. This bankruptcy of basic ethics and integrity infects not only the mainstream press at large, but has become a metastatic cancer within the DNC. Julian Assange gave us a rotting cat encore with his exposure of Debbie Wasserman Schultz and the coordinated rigging of the Democrat primary by the DNC. The DNC RIGGED the primary election to ensure that Sanders and his millions of supporters would lose. For years, conservatives were told election fraud doesn’t exist by the very same political party who just defrauded millions of their own voters and delegates. In light of this fraud, Debbie stepped down from the DNC but was immediately scooped up to be the Honorary Campaign Chair for Hillary Clinton–her Crook in Chief. It should then come as no surprise that the headlines aren’t about Islamic terror or the economy—a dying, American economy reminiscent of 1949, For those playing Pokemon Go, that was 67 years ago. Yet, the #TrumpOlympics has commenced as the press runs 24/7 with some Gold Star parents–the Khan’s, and the DNC tries desperately to pole-vault them to the newly crowned victims of the “soulless” Donald Trump. Other Gold Star parents were not given multiple interviews or an ounce of sympathy regarding the loss of their child to Islamic terrorists. Instead, the press dismissed Patricia Smith’s anguish and referred to her son as another sacrifice in times of war. A Liberal writer from GQ wanted to “beat Patricia Smith to death” after her RNC speech. But, at this point, what difference does it make? The press gave only 70 seconds of airtime to Patricia Smith as they “reported” from the RNC. In this political fog of war between Hillary, the Khans, the MSM Vs. Donald Trump, Iran is on the brink of nuclear proliferation with the help of Obama’s $400 million STERILE ransom payment for 4 American hostages, The Islamic State of Turkey is taking shape, and Isis is emboldened and growing. Ironically, in the wake of the many scandals and continued bloodshed, the Democrats have suddenly found The Constitution–used as a prop and waved by Mr. Khan while standing next to his hijab-clad wife. 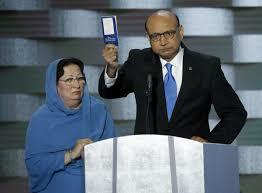 The Khan’s were both rightfully and respectfully acknowledged and honored as Gold Star parents of Capt. Humayun Khan, who was killed by a roadside bomb, in Iraq in 2004. 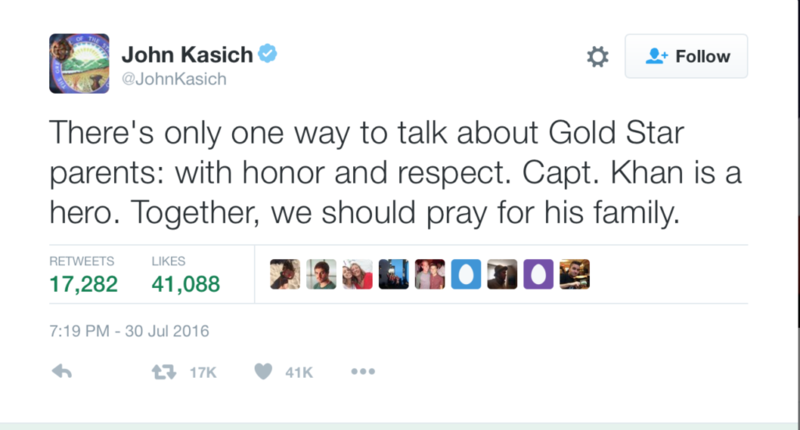 Yet, the Kahn’s weren’t there to speak out against the Islamic terrorists who killed their son. Nor did they blame Hillary Clinton–the woman who voted for the war, the Iraqi theater in which their son paid the ultimate sacrifice. As I watched them that night, I found the visual and accompanying speech by the Khan’s quite odd. What I thought was the new and improved Code Pink developing before my eyes suddenly became a DNC talking-point attack on Donald Trump’s immigration policies. I was taught at a young age to not raise your fist unless you’re willing to use it. We can argue about the judgement of Donald Trump entering the fray and “stepping in it”–as we now know that the media is Hillary’s life jacket. But, one simple question that has not been asked during this media love affair with the Khan’s is their position on Sharia law and whether they believe that Sharia law trumps our constitutional law? According to Mr. Khan’s work and advocacy, he does. As Breitbart reports, Mr. Khan can not only be further tied to Saudi Arabia, but to the Clinton Foundation as well. Upon exposing this information, the media darlings of the Clinton’s spun this exposé as ” Thin Oppo Research attacking a Muslim Gold Star family.” However, upon the reveal of this “thin oppo research,” the website of Mr. Khan’s law firm suddenly disappeared. “The father of a Muslim-American soldier killed in Iraq who is caught up in a war of words with Republican presidential candidate Donald Trump is an immigration lawyer who specializes in a highly controversial program accused of letting immigrants buy their way into the U.S.
Thankfully, these programs have recently come under congressional scrutiny and are being challenged by Chuck Grassley. Nonetheless, the moment the Khan’s stepped on stage and became political advocates for Hillary’s immigration policies, they abandoned their proclaimed need for a return to private life—a private life which now includes daily multiple television interviews, news paper op-eds, and their latest calls for the GOP presidential nominee to step down. The Khan’s don’t seem to want to go away quietly, and the press and the Khanservatives are anxious to help in their mission to save Hillary. John McCain, the 79 year old senator from AZ, followed his lead and reiterated the left’s talking points by admonishing Trump for “attacking” the Khan family. The marginalized #NeverTrump movement seized their latest Lefty opportunity. For a movement who proudly claims to be comprised of Constitutional Conservatives, they have abandoned any principles related to sovereignty in their support of Gary Johnson and have abandoned all conservative principles in their continued defense of Hillary Clinton through their relentless attacks on Donald Trump. In his first interview after the Khan’s attacked his policies and his character, Donald Trump referred to Captain Khan as an American hero, defended himself from the baseless attacks–as he is known to do, and asked the questions the media and the Khanservatives refuse to do before jumping to conclusions. At the RNC, Donald Trump promised the American people the Truth. Julian Assange has promised to expose more of the Truth in the coming days. The Khanservatives can choose to speak honestly about broken visa programs and unabated immigration in relation to increased terror risks, or they can continue their losing streak to someone like Paul Nehlen. When it comes to honesty, the history of the Khanservatives is to choose payouts and power over patriotism and globalist bridges over sovereign borders….just like their progressive champion, Hillary Clinton. BREAKING NEWS: We just began bombing Libya because of a contained, non-Islamic group named ISIS. Can someone in the press or at the RNC ask Hillary, Obama or John Kerry, if “this is what democracy looks like” or should the majority of news consumers be kept in ignorance by a Khan Job designed by the DNC and implemented by the media? Great article Reagan Baby…spot on. No matter how the media lies about Trump,they can’t hide the fact that Hilary is the worst candidate the dems have ever had. We,the public,are on to your games media. The choice is clear..vote for pro American Trump or anti-American Hilary. To give democracy to other countries by allowing a vote, and saying -“not taking sides”, is not possible in Islamic areas where Shites and Suinies [sp?] believe in appointment Vs. bloodship linage of Mohamad to leadership. The vote idea is not an easy one way idea, and it is understood, along with other islam beliefs, that the college educated USA leaders know.